The holiday season can be the most wonderful, and stressful, time of the year. With gifts to buy, family to see and trips to plan, sometimes it’s hard to make room for fun. This year, allow us to plan your holiday getaway to Baton Rouge for guaranteed fun. With this bucket list, each holiday weekend will be one to remember. *postponed due to weather* - check their facebook page for the latest details https://www.facebook.com/brchristmasparade/. Local’s favorite way to celebrate the holidays has to be with a Baton Rouge tradition since 1949. The 65th annual Cortana Kiwanis Downtown Christmas Parade will be held on December 12th and is open to everyone. The parade showcases local businesses, dance crews, marching bands, non-profit organizations and much more of the Baton Rouge community. Founded in 1977, the Cortana Kiwanis Club dedicates their efforts towards bettering the community through meaningful service projects. For more information on the parade visit www.christmasinbr.com. Though Baton Rouge is known for blues and jazz, we love classic rock n’ roll. Classic rock legends Lynyrd Skynyrd will be performing at the Raising Cane’s River Center Arena on December 7th as part of their farewell tour. For more information on the concert, hotel packages or more trip ideas while in the capital, visit https://www.visitbatonrouge.com/lynyrd-skynyrd/. For holiday fun the whole family can enjoy, visit BREC’s Baton Rouge Zoo and witness their newer tradition, ZooLights. The zoo has a mile-long trail filled with custom light displays that feature traditional holiday scenes as well as giant and animated spectaculars of your child’s favorite animals and characters! More information. Some say there’s nothing more captivating than the twinkling of Christmas lights at night. Shadrack’s Christmas Wonderland thinks so too--but on a whole different level. Located just 30 minutes outside of Baton Rouge in Gonzales holds the most outstanding Christmas lights display, a whole 2 miles of lights that are programmed to dance and light up to the beat of your radio channel! The show opened in November at the Lamar-Dixon Expo Center and will be open until January 6, 2019. More information. Finding that perfect gift doesn’t have to be a hassle! Here in Baton Rouge, we have enough shopping destinations where you can find everything from name-brand buys to one-of-a-kind antiques. Read more about shopping in the capital here. Ring in the New Year in the Red Stick with events such as the Red Stick Revelry and events at L&apos;auberge Casino! 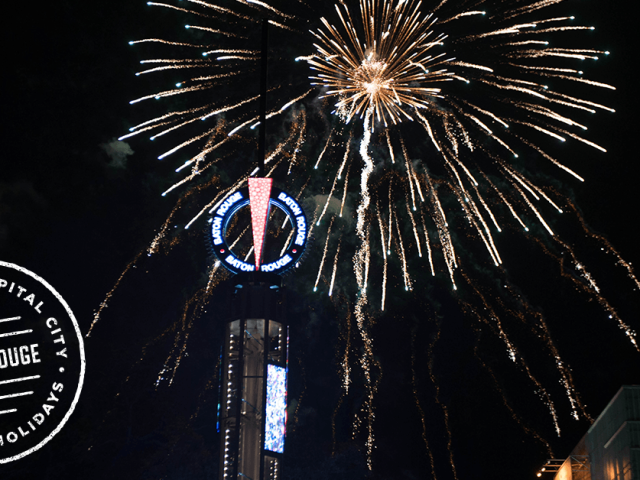 Baton Rouge’s official New Year’s celebration, Red Stick Revelry, is a countdown celebration full of entertainment that begins in the morning and lasts through the new year! This year, there will be a laser light show with a spectacular finale when the ball drops! For more information visit www.redstickrevelry.com. For those who are 21 and over, L’auberge Casino Hotel is hosting its NYE Bash with live entertainment! Better hurry, tickets tend to sell quickly! For more information, visit the L’auberge events page.